To make the deep flavors of this dish even more delicious add some dried porcini: soak about 1/3 cup dried porcini in hot water to cover; chop the porcini and add them to the fresh mushrooms after they’re cooked. Use about 1/2 cup of the soaking liquid in place of 1/2 cup of the stock or wine. Bring a medium pot of salted water to a boil, add the asparagus, and blanch until bright green and crisp-tender, 2 to 3 min. Drain and set aside. Add 1 Tbs. of the olive oil to the skillet, heat, add the mushrooms. Cook over medium-high heat until browned and the mushrooms have released their juices, 10 to 15 minutes. Increase the heat to high and cook until the mushrooms are dry and nicely browned. Transfer them to a bowl and reserve. Reduce the heat to medium high. Add the last 1 Tbs. of oil and sauté the shallot, scallions, and garlic for about 2 minutes until softened and lightly browned. Add the wine and deglaze the pan by scraping up any browned juices. Boil until the liquid is reduced to a syrupy glaze. Add the stock, tomato paste,and oregano. Simmer for a few minutes, and then whisk in the butter paste bit by bit. Simmer another minute until the sauce thickens a bit. Add the cooked asparagus and mushrooms to the sauce, taste, and season with salt and pepper. Pour into a 2-qt. baking dish. Pile the potatoes loosely on the filling for a more appealing, fluffy look. Heat the oven to 375°F. 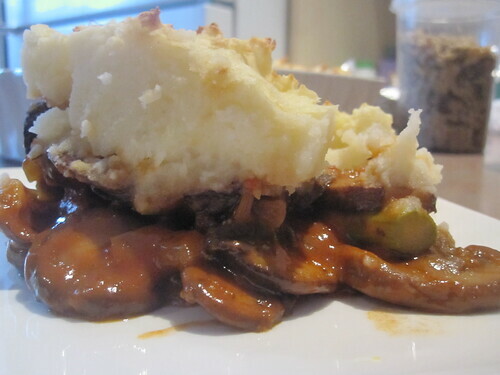 Drop spoonfuls of the mashed potatoes on the mushroom filling and spread gently to form an even (but not too smooth) layer. Bake in the hot oven until the potatoes are light brown and the filling is bubbling, 25 – 30 minutes. I need to post something to test the mail alerts.